I can’t get enough of the fresh sage growing in the flower pot on my porch. One of my favorite ways to eat sage is fried, with butter, on pasta. 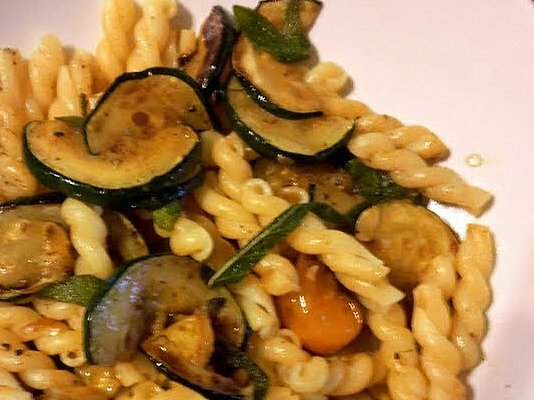 I was feeling just a little guilty about the pasta/butter dinner combo, so I added some lovely zucchini, fried in homemade herb butter, olive oil and garlic, and some burst yellow baby heirloom tomatoes. Had I nice aged pecorino I would have shaved a generous amount on top, but plenty of ground pepper and large crystal sea salt more than did the trick. And can I just rave for a minute about this pasta that I bought at DiBruno brothers? All pasta is NOT the same, and the flavor and firmness in the Bartolini pasta can’t be beat. I ate two bowls, and loved every bite.